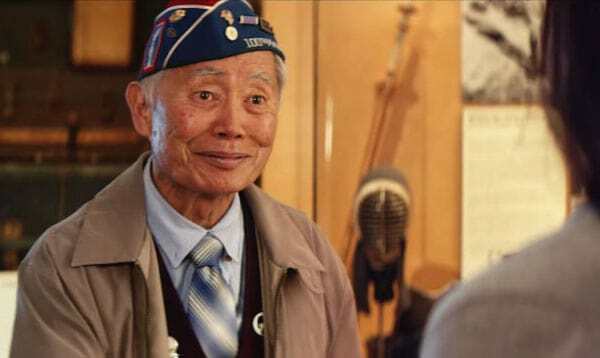 George Takei stars in the short film, American, about a 94-year-old veteran who works as a volunteer at the Japanese American National Museum. When he encounters a young family, that brings back events that happened in his past, including his time as a young man in a Japanese American Internment Camp. Takei took part in a press conference at the fourth annual GI Film Festival in San Diego where he talked about his activism, the film, why he took the role and bringing the musical, Allegiance, to Broadway. George Takei: It’s been my mission in life. I grew up behind those barbed wire fences, as a five year old I was categorized as an enemy. All Japanese Americans on the West Coast were categorized as enemy. My mother was born in Sacramento California. My father was a San Franciscan. We’re Americans and yet war hysteria spread throughout the country. I had taken it on for myself, as my life mission, to raise awareness of this large chapter of American history. Particularly because today, especially now, it’s so timely. The story is so relevant. Whether it’s the very first Executive Order passed by our current man that’s called the president. He signed the first Muslim travel ban in February 2017. There was such an uproar over that. I mean Americans had learned a lesson of the America, incarceration of Japanese-Americans. Because when that first Executive Order was signed, thousands of Americans, all throughout the country, rushed to their respective airports to protest the Muslim travel ban. Lawyers went to the airports to offer pro-bono service. The Deputy Attorney General of the United States, Sally Yates, refused to defend that. And so, what he tried a second time and that didn’t fly either and a third time. Finally, the Supreme Court gave it, its approval. This relevance to our times today but during my adult life, it’s been my mission to inform fellow Americans of that chapter. And so when Richie approached me with this project I immediately took it on because the payment wasn’t much [laughs], but the script was substantial. It was a short, but it took place inside a museum that we founded. I’m one of the founders of the Japanese-American National Museum. And we tell the story intellectually and historically. But, we also wanted to tell the story so it hits people’s hearts. We humanize that story and San Diego played an important part in that. We developed a musical called, Allegiance that talks about the incarceration of Japanese-Americans and how that incarceration shattered, fractured, the Japanese-American community and Japanese-American families in many cases as well. We had the first premier performance of Allegiance here in San Diego at the very respected Old Globe Theater, in Balboa Park. And so San Diego has a near and dear part of my heart because of that connection to our mission. When we did Allegiance on Broadway some Japanese-Americans traveled across the country to see it, in New York. And one evening, a Japanese-American woman brought her 92 year old mother backstage to introduce her to me. And she introduced her mother as someone who, as a teenager, worked with my father, who was a block manager in the Arkansas camp. A camp called Rohwer. And I remember, not so much Florence, that’s the name of the lady, but I remember this lady that had a machine in that office and she was tap, tap, tapping away. As a five year old kid, I was absolutely fascinated by how she did that and made that sound and then kept it up and when she zipped the paper out, it was a report that she was typing out. Very formal looking print. I remember as a five year old kid being absolutely impressed by that. Well, she, that same young girl, was now this 92 year old lady that I was being introduced too backstage at the Longacre Theatre. She’s the lady he just mentioned, my father’s secretary at the Rohwer camp. And so we have a very convoluted connection to the story. Both in terms of the story itself but also a personal connection. This is a very personal role for you. What were some of the emotions and feelings you were having when you were playing this character because it’s important to your heart. George Takei: Well, I’m playing a 95 year old man. So, I have to reach as an actor, he made me look old enough. But I know those people. The veterans that volunteered at the museum. I used to be the Chairman of The Board at the museum and I’m still on the Board of Trustees. And I have spoken with and gotten to know, be friends with those volunteers. I know those people and I think of the names. I think of Minabe or Tad, all these people who are now gone but they took their mission as volunteers to tell that story, very seriously. Richie Adams: Yes, George played a 95 year old. The only real direction I had to give George was, “Okay, slow it down. Remember you’re supposed to be 95.” And then he would and then he would walk back in and I’d say, “Perfect!” And that was literally the only thing I had to tell him. [Richie] is a wonderful director. He’s a passionate director. I could feel his passion in telling that story. It’s not personal like me, and yet he made it personal for himself. And so, the pleasure, as hectic and as exhausting and as brief as that was, it was last year, but we shot at the museum that we founded. Half a block from our museum, is a huge black granite monument that bears all the names of the members of 442nd, who served. Young men who went from barbed wire imprisonment in their own country to fight for the country that was still imprisoning their family. It’s an amazing story. Incredible story. People who bit the bullet and swallowed the bitter taste and put on the same uniform as that of the sentries in the guard towers with their guns kept pointed at us, and their families, they went out of those barbed wire camps to fight for this country. To prove they’re Americanism. It’s an unbelievable story and now we are telling that story to all of America. With the museum, with Broadway musicals, and with the film.